Main body & sleeve hardened & ground. Operator friendly design for dismantling & assembling. The user can change the bearings after long use or wear within few hours , all details are shown in schematric drawing. Being standard MT2 & MT3 internal tapers in MT4 & MT5 revolving centers respectively, easy to replace centers of standard angle to, 30 degrees angle to pipe center . OR…. Accuracy :On master mandrel within 0.010 MM MAX. Item Name D D1 d d1 L L1 K MT3 REVOLVING CENTER WITH INTERNAL MT1 TAPER 6 &n.. 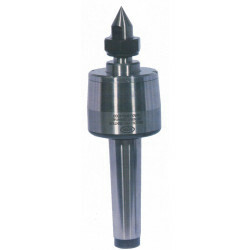 Item Name D D1 d d1 L L1 K MT4 REVOLVING CENTER WITH INTERNAL MT2 TAPER 70 &..
Where can I buy Revolving Center Online?